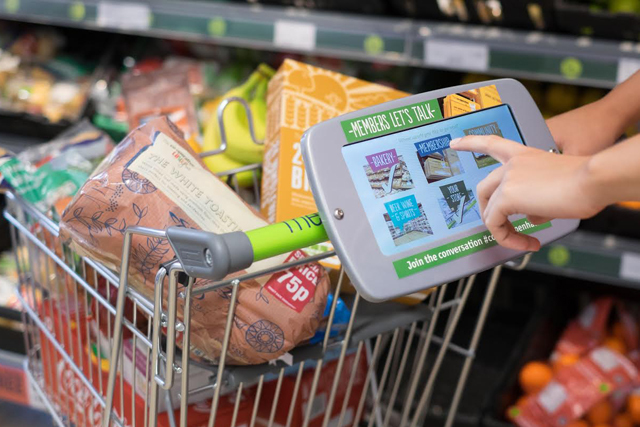 The Co-operative Food is introducing hi-tech trolleys to selected stores so that its customers can use a bolted-on tablet to express their views on products, services and social issues while they shop. Selected Co-op stores are trialling the new scheme, which prompts shoppers at various points in-store to answer questions about the layout, the ranges and products on offer. More general questions will quiz consumers on issues such as sustainable food, youth unemployment and localism. The Co-operative group will use the data accrued to inform its customer offering, both in terms of the store experience and the impact of its business beyond its shops and into the broader community. The measure is part of a group-wide drive to improve its business, which has faced much controversy in recent years. The retailer has also set up an online version of the questionnaire for those customers unable to use one of the tablet-enabled trollyes, while customers can also tweet their views. Andrew Mann, The Co-operative Food’s customer director, said: "If we are to fulfil our ambition to be the UK’s best local food retailer, it is really important that we know what our members think about our stores and act upon their feedback. "The hi-tech trolleys not only make it easy for customers to tell us about their shopping experience, but because the information is collated digitally, we can access what they say almost instantly. "Our new stated purpose emphasises the importance we place on communities and so this feedback will also enable us to find out what our members and customers think about our community engagement." The measure is part of parent The Co-operative Group’s aim to improve its customer service and restore confidence across all aspects of the business, which has been subject to various scandals. In particular, the revelations of a £1.5bn shortfall caused a political storm and highlighted former chairman Paul Flowers’ mismanagement of the business and unconventional lifestyle, including alleged drug taking. Earlier this year, the group asked consumers to help it shape its strategy, including how it should help local communities, whether or not it should make political donations, and how it should reward shareholders. The following month, group chief executive Euan Sutherland quit, declaring the group "ungovernable".